Jacob faced obstacles throughout his life. He had a father who favored his older brother; the one who came to hate him and wanted to kill him. He had to deal with a deceptive and treacherous father-in-law for twenty years. He was tricked into marrying a woman whom he did not love. His sons sold their brother into slavery and led him to believe that Joseph was slain by a wild animal. While not always an exemplar of ethical behavior himself, Jacob’s life can teach us about facing obstacles, of which we have many. We are facing an increase in anti-Semitism both globally and even within the US. At times, we Messianic Jews face hostility from both the traditional Jewish world and the church world. We don’t always grow in numbers as fast as we would like to. We sometimes lose people to traditional Judaism or Christianity. We sometimes despair that our movement is not growing in Yiddishkeit as we would like it to. In times like these, we can learn from how Jacob handled obstacles. First, Jacob had a vision. As Jacob is on his way to Haran, God appears to him in a dream and assures him of his protection (Gen 28:12–15). God promises him that his descendants will be as numerous as the dust of the earth and that the nations of the world will be blessed through him. This vision of his future from Hashem gave Jacob the fortitude to venture off into unknown territory and an uncertain future. The text tells us that he arose early. He was energized by this God-given vision. But Jacob does not rely solely on this vision from God. He also takes the initiative to work towards his goals. He doesn’t allow his uncle Lavan to dictate the terms of his marrying Rachel, but offers to work for her for seven years. When he is tricked into marrying her sister, he does not fall into despair but picks himself up and works towards his goal. When Lavan pressures him into staying, Jacob devises a plan to prosper himself. Jacob is even careful about how he approaches his brother when he returns home. So it is with us. We have a God-given vision for a thriving community of Jewish followers of Yeshua. We need to be strengthened and emboldened by this vision. Whenever we feel despair with our movement, we need to recall that Hashem’s hand is in this and it will prosper. It may take longer than we would like to come to fruition, and there may be many hurdles along the way, but his will shall be accomplished. But we should not sit idly by waiting for God’s vision to be fulfilled. We can also strive to build our movement, as we are energized by the vision. We need to use our talents and energies to build towards the vision of that future. 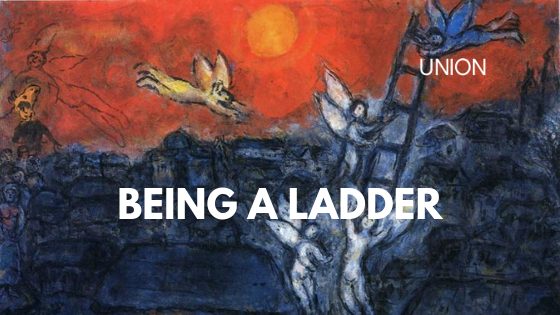 A commentary on our parasha that I recently read likens Israel to the ladder in Jacob’s dream. We are a ladder rooted in the earth but also reaching for the stars. Just as no one uses a ladder to stand still, we too must be ever striving to reach our God-given goals. Rabbi Tarfon says in Pirke Avot “You are not obligated to complete the work, but neither are you free to desist from it” (2:21). May we not grow weary when we face obstacles. May we cling to the vision that God has given us! May it energize us to “rise early” and be about our divine work. May we strive to build a Messianic Judaism that will flourish for generations and bring honor to Hashem and his Messiah.